Planting Method: Seed or cuttings. Best to plant 4 inch transplants. Harvest Time: Any time the flowers are present and the toxic chemical pesticides aren’t. Growth Habits: Waxy leaves and red, pink, or white summer flowers. Begonias bloom throughout the summer. Under an organic program, begonias will sometimes perennialize. Culture: Begonias need healthy, loose, organic soil. Plant the red-leaf varieties in sun to partial shade, the green-leaf varieties in partial shade to shade. Leggy plants can be cut back in summer for additional blooming. Use the basic organic program and spray often with Garrett Juice. Troubles and Solutions: Slugs and cutworms. Foliage and flower burn when the tender varieties are used in sunny areas. Treat slugs and cutworms with DE, hot pepper and cedar flakes. Harvest and Storage: Edible flowers can be picked and eaten or used in teas at any time with one exception. Most bedding plants are commercially grown using toxic pesticides and synthetic fertilizers. The plants need to be grown and maintained in an organic program to be safe to eat. Notes: The flowers are delicious on sherbet and other deserts, especially cold ones. 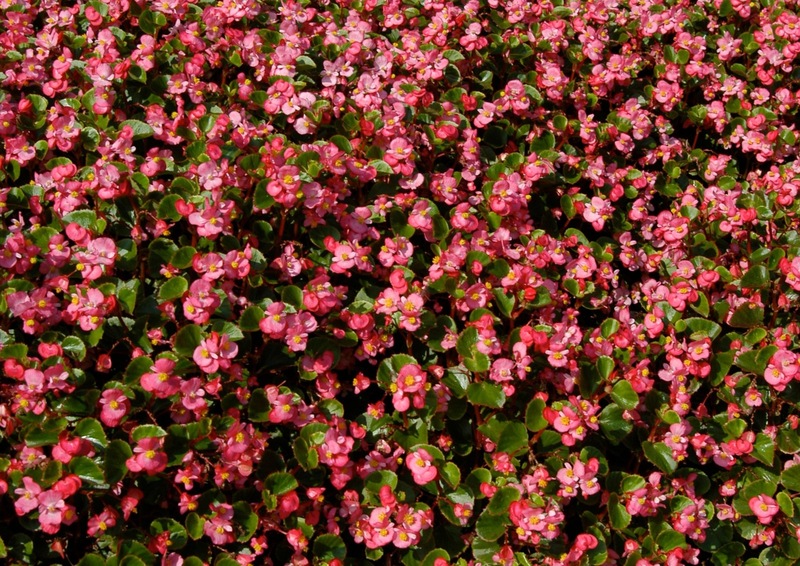 or wax begonia is an annual bedding plant that will sometimes perennialize during mild winters in the south. Planted in sun to part shade begonias grow to a height of six to fifteen inches, spread to twelve to eighteen inches and should be planted on a spacing of nine to twelve inches. Available in red, pink, or white summer flowers, the red leaf varieties can stand more sun, the green leaf varieties need more shade. Propagation can be done by seed or cuttings. Begonias bloom non-stop throughout the summer if planted in loose, well-prepared beds, with lots of compost, rock minerals and good drainage. Plant 4 inch pots in the spring, after the last freeze, for summer color in beds, hanging baskets or pots. Potential problems include slugs, pill bugs and cutworms, but can be controlled with a dry mix of natural diatomaceous earth, hot pepper and horticultural cedar. Plants grown in pots can be moved indoors and saved through winter, although it is way too much trouble. Fertilize three times per growing season with organic fertilizer and spray every two weeks with Garrett Juice. Cut back leggy plants in summer for renewed blooming. Healthy plants will provide lots of delicious flowers for sherbet and other desserts, especially cold ones. The most overlooked asset of begonias is that the colorful blooms are delicious and can also be used in salads, deserts and teas. Tropical natives from rain forests from Mexico to China to Japan. Some like almost full sun to full shade, but most like bright light (no direct sun) with high humidity. Cane (angel wing), shrub, semperflorens, and trailing begonias do well in the ground and will winter over if heavily mulched. Rhizomatous and thick stemmed types can grow in Houston but are subject to root rot when over watered. Tuberous, rex, reiger and some trailing types are not winter hardy in Houston. Rex Begonias have colorful leaves and can grow indoors or out. Pinch off shoots for bushier plants and more blooms. All begonias need well drained beds but can be grown in containers. Q: I have been planting begonias in my yard for years and typically they are my best performing plant. However, this year, it seems my begonias, and begonias everywhere are having problems (i.e. short stunted growth). Is there a problem with begonias this year? A.H., Richardson. A: It may be the growth retardants used at the wholesale growers. If additional fertilizer doesn't help, that might be the case. Buying from garden centers that specialize in organic products and techniques will give you a better chance of getting vigorous plants. NOTE: All begonia flowers are edible and useful in salads, teas and as garnish. One of the cane-stemmed angel wing begonias shown below.